Each year the Splunk Revolution Awards recognizes truly spectacular achievements of Splunk teams and users around the world. For the past six years, we’ve been using the Splunk platform to deliver innovative apps to help enterprises improve their security and compliance posture. Qmulos is changing the paradigm for cybersecurity integrated risk management (IRM) with Enterprise-Class software for cloud, enterprise, and hybrid environments. Our approach harnesses machine data to provide real-time insight into what security and privacy controls are actually in place, whether or not they are effective, and automates adaptive response actions driven from live technical evidence. 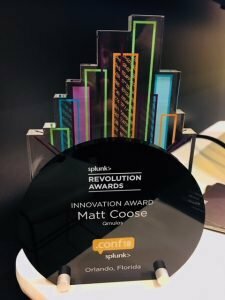 Thanks to our partner, Splunk for honoring us with the 2018 Innovation Award at .conf18. Continue to follow us to stay up-to-date with all the exciting things on the horizon for Qmulos!